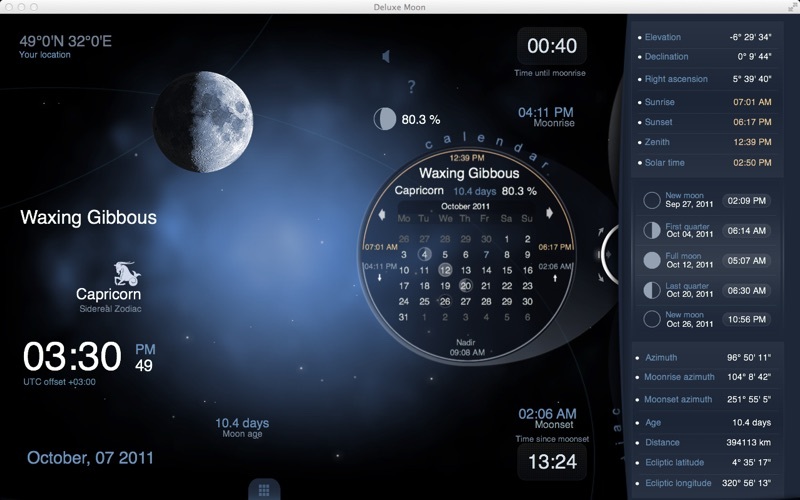 Deluxe Moon is a beautifully crafted moon application with innovative lunar design. 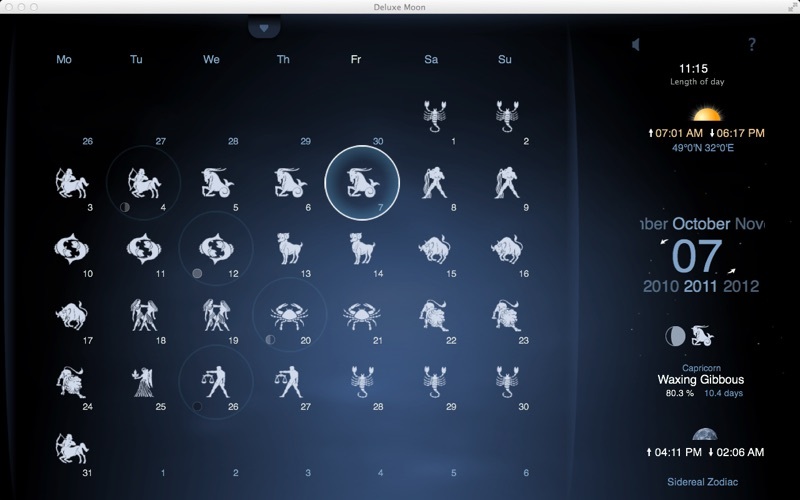 The application combines traditional lunar themes with modern technology to bring you the best: style, convenience of the moon in a pocket and a feature rich interface. Comprehensive moon information, precise moon phase times, animated Zodiac circles, moon horoscope and calendar, sunset and sunrise times and moon day descriptions and much more. Are there connections between the moon and plants, human emotions, blood pressure, health or finance? Discover new amazing relationships with Deluxe Moon application! 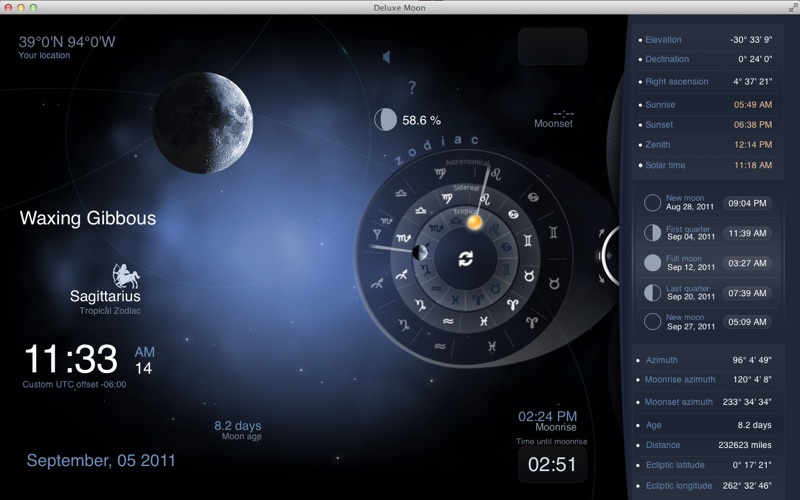 Interface - Moon calendar with Moon phases and Zodiac signs. - Moon azimuths on a compass like dial. - Set any location, time, date and UTC offset. - Works anywhere without Internet! Moon Parameters - Full names of all moon phases. - Precise moon phase times. - Current moon age - Zodiac sign the moon is in. - Ecliptic longitude and latitude. - Percent of the illuminated moon area. - Moonrise and moonset times for your location. - Sunrise, sunset and zenith: tap on countdown timers. - Countdown moon timers: amount of time since moonrise and until moonset. - Current, moonrise and moonset azimuths. - Moon distance from the Earth. - Moon elevation. 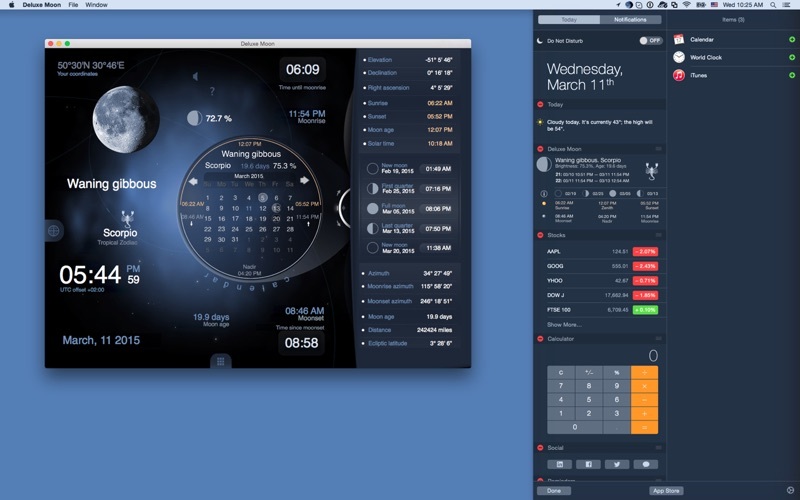 More screenshots and video: www.DeluxeMoon.com Video: http://www.youtube.com/watch?v=nzFKxcvcnU0 If you like Deluxe Moon, please write us a review on Mac Store. Your support would greatly help us make the application even better! For iOS version please look for Deluxe Moon application. Beautifully laid out, functional and pleasing to the eye. I NEED SOLUTION Buy this application for my iPhone and it works perfect. But I bought it for my Mac and I can not get it in Spanish. So I need a solution. Also, when I go to print it tells me that it is NOT allowed. So ... I pay for the application ... what else do I need to do ????? Deluxe moon HD is deluxe . . . except . . . The app does not permit accurate lat/lon entries. Latitude entries only go to 59 minutes which means those of us who are located more than 59 minutes above/below our local latitude are not accurately placed in the app. Why is this important? because it means our phases are slightly off as is our solar time. These two discrepancies will get worse over time. Other than this, it’s a baeutoiful app well-done. If the developer fixes the lat/lon problems and provides the ability to set them precisely, I’ll change my rating. Love the images and easy to access helpful information. this app is excellently made, highly informative and seamless. thanks! You want this app! It’s really beautiful and has so many features (void of course) which i couldn’t find without buying it and a lovely added bonus of classical music…what a beautiful touch. Thank you! Deluxe Moon HD version 1.35 may display properly on newer OSX versions but on my Mac Book Pro using OSX 10.7.5 Deluxe Moon HD version 1.35 has a screen drawing issue that causes it to not display properly. Fortunately I had a backup of version 1.34 which I have gone back to using. Hopefully the developer will correct this problem in the next version. I’ve had this app for years & use it regularly. Love the ability to interface important info onto my calendar! This app is one of my ongoing top favorites. 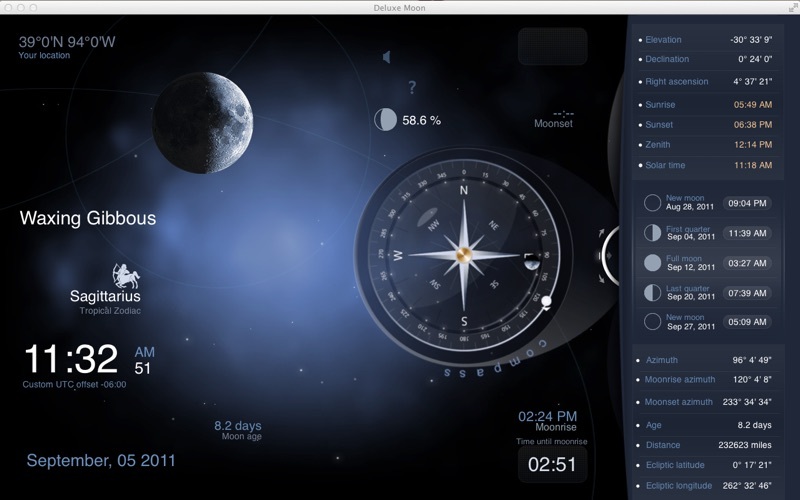 The latest update works perfectly for me on both my new iMac and my 3-year-old Macbook Air, and I continue to enjoy this gorgeous and educational way to visit the magical moon in the deep night sky.